I was asked by the Salt Lake City chapter of the Embroiderer’s Guild of America if I would speak at their 2010 annual regional meeting. Never having been to Salt Lake City before, I agreed. I’m tired of flying. The seats are cramped, and getting through security is a real hassle. So I decided to take a train. And because I haven’t taken the Empire Builder through the Rocky Mountains, I decided to go that way. And I decided to make stops along the way, doing talks (for which I charge a speaker’s fee of $200), and book signings. 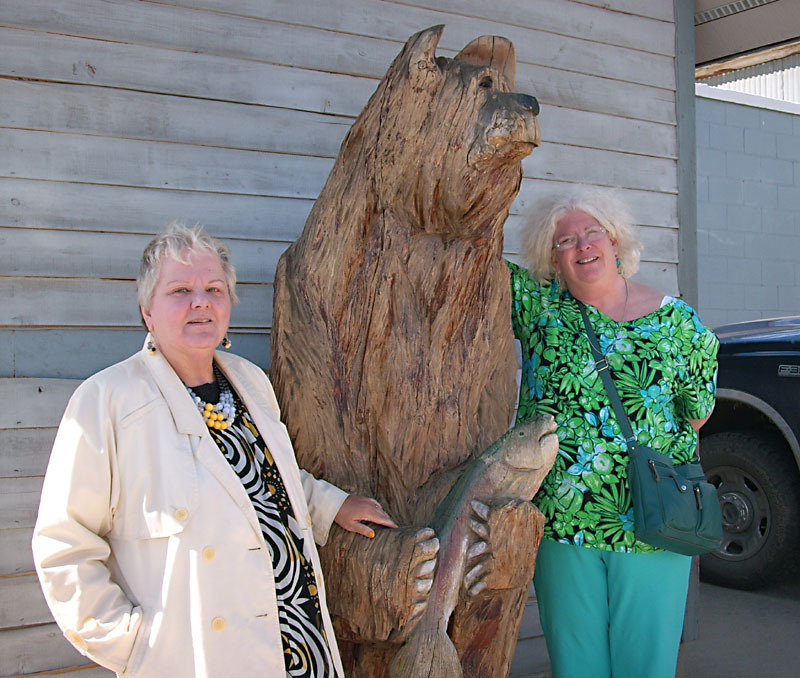 Ellen didn’t like the idea of such a long trip, so I invited Tanya Dee Smith, a good friend and recently-retired school teacher to come along. We set off on the first of June, 2010. I kept a diary of the trip. Here are some excepts. The seats on The Empire Builder are far more roomy than on an airliner or even a bus. They have footrests and a flap beneath the seat you can pull out to rest your lower legs on, so when you let the back of the seat lean backwards, it’s almost like a Lay-Z-Boy. The train leaves St. Paul, Minnesota at 11:20 in the evening, which is past my bedtime already. The car we were assigned to is two stories high, and we were assigned to the upstairs. It didn’t have the seat number marked on our ticket, so we found a pair of seats in the back of the car and sat down together. All the other seats were taken by singletons and we wanted to sit together. The train started moving so smoothly and quietly that we didn’t notice for a few seconds that we were moving. It was like we were sneaking out of town. The car is 85 feet long, front to back. The exit is halfway along on the left, a twisty narrow staircase with higher than average risers. There is a big luggage storage area at the bottom of the stairs, and a restroom. The seats down there are reserved for people who would have trouble climbing those stairs. We got glimpses of downtown Minneapolis, all lit up and beautiful. Here and there we’d cross a street, the red lights flashing through our windows. The car rocked gently. I dozed and woke, dozed and woke. Now and again we’d pull into a station and people would get off or on, then we’d drift silently out of town and I’d doze off again. The conductor came by at last to tell us we were ten minutes out of Fargo, North Dakota. We made our way down the incredibly narrow staircase to the lower floor as the train slowed and came to a stop. I had the big cardboard box that held my fancy hat in one hand, my enormous purse in the other. We got off and stood, dazed and sleepy, then claimed our enormous suitcases and set off on the three-block walk to the Radisson Hotel, which is very nice. Debi and Roz of Nordic Needle needlework store took us to lunch at the VIP Lounge in Block Six, a former department store that has seen several remodelings into small businesses. Nordic Needle started out in this building, going from one small office to a bigger office with storage rooms on the top floor. Now they have their own 9,000 square foot building, built from scratch — and they’re starting to feel cramped in it. The building has some beautiful woodwork, including a fine staircase, and a curious old radiator that encircles a pillar. Then we drove around town, focusing on the nicer homes of Eighth Street, looking for the old house my murder victim owns. (I was working on Threadbare during the trip.) We finally found a condemned house in an area where the Red River had flooded. Then we went to the local YWCA women’s shelter for a lengthy and extraordinarily detailed tour. One of the staff, when she heard it was research for a murder mystery, kept explaining what my victim would have faced while staying at the shelter. Very, very helpful! Then we were taken to the Nordic Needle shop where a little table had been set up with a few stems of gorgeous iris in a bud vase. There was a good crowd that kept rebuilding itself for the better part of an hour, then thinned but held for almost a second hour. I signed a LOT of books. We were driven back to the hotel where we retrieved our luggage and changed back into our traveling clothes. The train depot opened at midnight, and at 3:30 a.m. (!) the westbound Empire Builder came and we were off to Wolf Point, Montana..
Oh, boy, hills! Up till now it’s been flat as a table. We slept a few hours on the train and at seven, since we were both awake, went up to the dining car for breakfast. I had the corned beef hash, which was about the tastiest corned beef I’ve ever had. The train would pull into stations, Rugby, Minot, running about an hour late. We made up most of the lost time and pulled into Wolf Point, Montana around noon. It’s a dusty little town that has gone from 3500 people to 2500 in just a few years — sad. There’s no industry here, just farming, and all the little farmers are going under. It’s partly on an Indian reservation and about half the customers at the local McDonalds where we had lunch were Indian. There’s one grocery store, one hardware store, one clothing store, no competition to keep prices low. The nearest Wal Mart is a hundred miles away and everything else is even farther. But the people are nice. We had a very small turnout at the library but they were interested. One of the librarians wants to be a writer, so she took copious notes during my talk. We had a real shower and slept in a real bed that night. was spent on the train. It was interesting to watch the terrain change as we went farther west. At first the land is very flat, then it gets a little rolling. The grass cover thins out, like someone whose hair is thinning, and you start to see the ground through the grass. Tanya saw a coyote in a pasture near the train tracks. We saw sheep, horses, cattle. No buffalo or wildcats. Lots of birds. They had been getting too much rain so we saw lots of standing water in the fields with lots of happy ducks. The lilacs were still blooming here (they’re finished in Minneapolis). We had lunch in the dining car and played gin rummy in the observation car (they call it the lounge car nowadays). I had a curry dish that was very delicious. A Welsh couple sat across from us; they’re touring the whole country by train. They really like America, they said. Now and again out the window we’d see badlands, naked ground heaped up into steep mounds. The treeless prairie spreads out forever along this route — “Big Sky Country” indeed. But then, far off, mountains! Is it a range if there are only three or four or five peaks? We’d see them, then go by and the land would be flat again, or covered with low hills that would sometimes come right up to the tracks and slide back again. Low mesas at one point made a flat line against the sky. The sky was clouded over when we pulled into Shelby and stopped for a long while. To start up again we had to back up across some points to get on the main line. Just east of Shelby we saw a cluster of big square corrals full of horses. We speculated what they might be doing there and hoped it wasn’t a round up of wild horses doomed to be slaughtered. Cut Bank, Montana is a small town with a tiny metal depot of recent vintage. Several people got off, were met or had cars parked in the gravel lot and they went away, leaving Tanya and me alone. The depot people went away, too. We tried calling the library – I was to give a speech there the next day — but it was closed. And no one at our motel answered the phone. A big old SUV pulled in, let an old man out, and started to pull away again. We waved at him, and he waved back, and we gestured that we weren’t waving hello but help. He drove over to us and we asked if there was a taxi company in town. He said yes but the owner (apparently there’s one taxicab) is hard to get hold of and he didn’t know the number. He turned us over to the old man, his father, who not only gave us a ride to our motel, he detoured around the little town to show us where the library is. A very nice man, a navy vet. I asked him about the horses and he said they are probably horses that are turned out to graze on farmers’ land over the winter, then rounded up and sent back to dude ranches and vacation spots in the summer for tourists to ride. That was a relief. It turned out that the motel is one of a pair, and no one was available in the one we’re staying at. We went across the street to inquire and the man (an East Indian) said the phone is supposed to roll over to him when there’s no one behind the desk at our motel. But apparently it doesn’t. So he came across and gave us our keys. We hauled our suitcases in and went to the little casino next door for supper. Della Dubbe of the Glacier County Public Library had tried to get hold of us yesterday without success. We managed to connect this morning and she came over around eleven-thirty to take us and our luggage to the library. She had a lectern and a number of chairs set up in the basement, but today was some big event at their civic center, plus it was the first week of school’s out, so everyone was busy with other things. So I sat in the first row, turned my chair around and we had a kind of round robin lecture. Maybe seven people showed up. Everyone had something to contribute, especially a woman named Jennie. But I got through my talk in fits and starts. 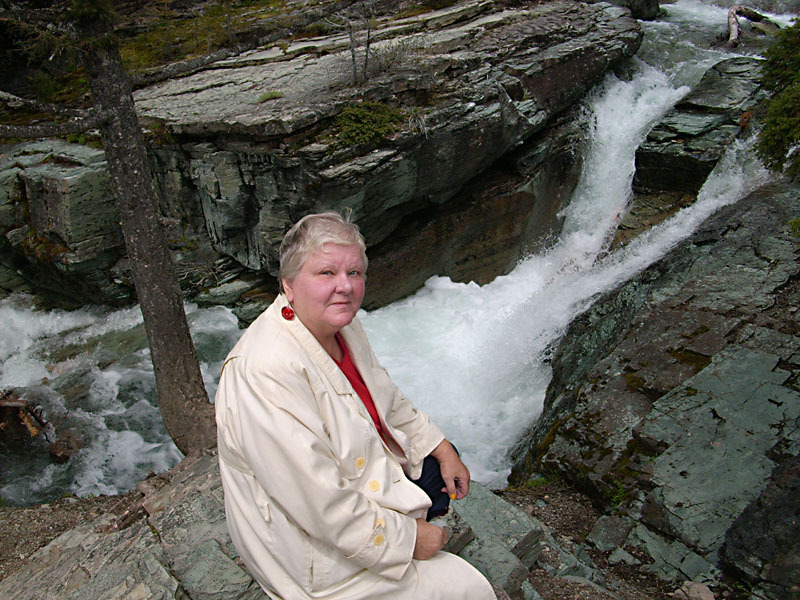 One young woman named Anne Stevens stayed after, and offered to come to East Glacier Park tomorrow and show us around personally. She works for the Agriculture Department, she’s from Missouri (here only about seven months) and seems very nice. She’s got a sturdy build, dark hair just starting to get gray streaks in it, and three grown children. After my lecture, she took us to a tiny diner near the railroad depot where we had a very late lunch. Then we went to the depot, a modest old wooden building, which was deserted but unlocked, and I used the ladies room to change into my crow shirt and skirt, which pleased Anne tremendously as her mother’s family surname is Crow. It wasn’t a very long ride to East Glacier Park — it’s about seventy miles away. The depot is large and old-fashioned, and there is a magnificent old lodge facing it a couple of hundred yards away, all dark wood and pillars. And all around are rugged mountains with broad streaks of snow on their rocky mounts. Very beautiful and exciting to just stand and stare at them. We checked in, then went out into the very small and modest downtown — wooden sidewalks! — looking for Serrano’s Mexican Restaurant. It was easy to find, in an old lodge-style building made of logs with a broad porch and beamed ceiling inside. We had had Serrano’s recommended highly to us by several people, who also instructed us to try their margaritas, so we did, and they were delicious! After the first one I placed a call to Ellen bragging about where I was and what I was doing, but the call quickly faded away. Cell phone service in the park is chancy and unreliable. We ate way too much, I had a slice of carrot layer cake with huckleberry filling for dessert that was delicious. And another margarita. We went to bed, but I woke up at three feeling very sorry for myself — too much to eat and drink. I lay in misery for about ninety minutes before falling asleep again. Woke up nice and early Sunday morning feeling fine. Went down to the office, where a modest breakfast waited. And a very friendly cat named Misty, a tiger longhair with a pretty face. We were washed up and packed when Anne arrived at nine. She offered to take us to the local Catholic church service, and we hemmed and hawed and voted no. We had places to see. The town of East Glacier Park is on the Blackfoot Indian Reservation; the entrance to the National Park is a few miles away. I’ve been sitting staring at my computer screen for several minutes, trying to think how to describe the beauty we saw. I’m sure you’ve seen photographs of mountains with snow on top of them, and narrow, rocky mountain streams gushing water, and big serene lakes with snow-capped mountains on the other side. That’s what we saw. It was like every mile brought a new picture postcard, only we were in it. We took tons of photographs. Anne said that two weeks ago there was snow on the lower ground where we were driving. At present it is green, green, green. The trees are newly leafed out, and the meadows are full of flowers. We stopped by a lake, walked across a little meadow, and a prairie dog barked and barked at us. On the lower part of the mountain across the lake, little pale tan shapes moved, about eight or ten or them. Anne’s binoculars showed them to be bighorn sheep. A couple with a vastly stronger pair of binoculars let us borrow them, and we could see the ragged coats of the sheep, who were shedding their winter coats. We stopped at St. Mary’s Lake and ate a delicious lunch at the Snow Goose Lodge. I bought my and Anne’s lunch when she wasn’t looking. We shopped briefly in the big gift shop and I bought a pair of round copper earrings, very thin, with red enamel on the outside painted with a stylized black turtle. Indian craft work, very pretty. Driving back, just as the mountains seemed about to close in — they’re very tall, with aspen and pine about two thirds of the way up, then rugged rock — suddenly there would be a wide opening and grassy meadows would fall away and you could see for miles and miles. Around a curve, and you’d be closely surrounded by mountains again. At another place we stopped, there was a hike of about half a mile to a gorgeous waterfall that had a curious tunnel or small cave about halfway down one rocky margin, also gushing water. 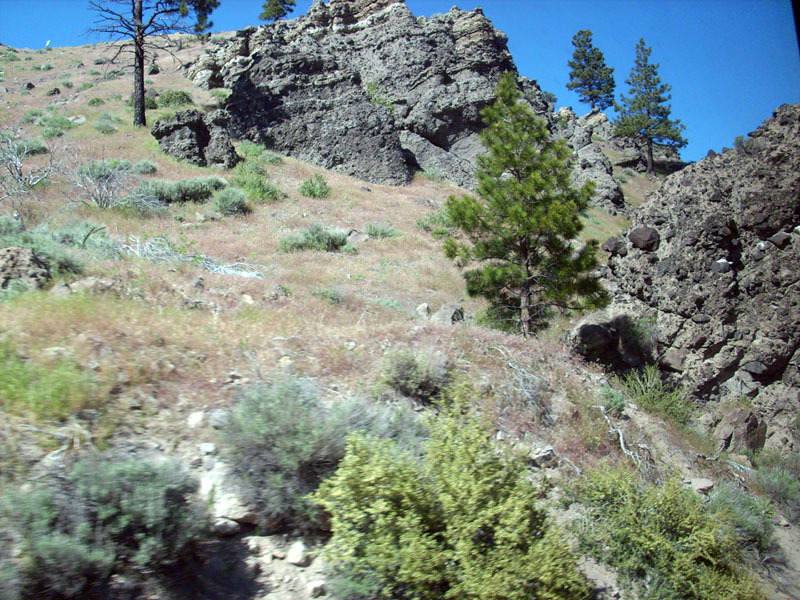 It is a sacred Indian site, named after a Blackfoot female warrior named Running Eagle. 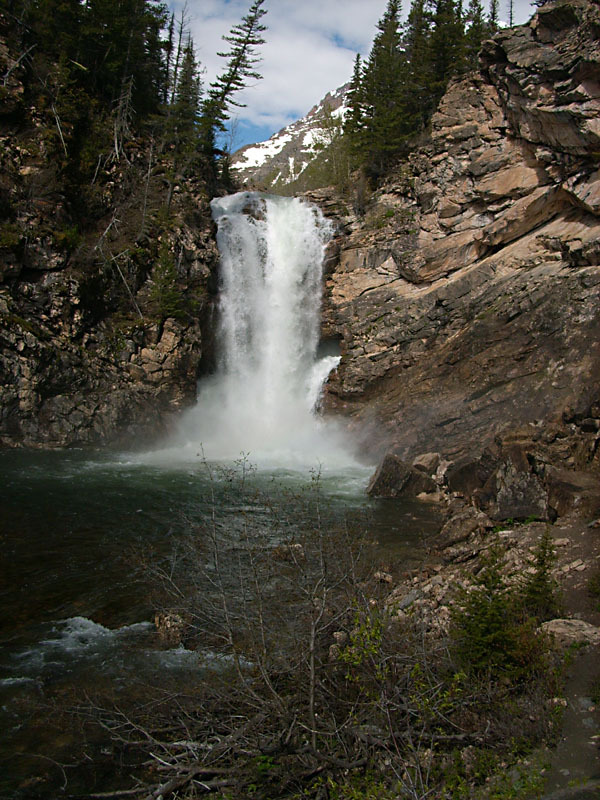 Its American name is Trick Falls. Here and there we’d see a little grove of trees with fabric wrapped around the trunks or branches. Anne said these were holy places and the fabric was offerings. We didn’t see any buffalo or moose, but did see bear, bighorn sheep, lots of magpie birds, deer, rabbits, elk, and prairie dogs. In fact, a grizzly bear was spotted running across that magnificent lodge across from the railroad depot — I got to see just the back of him as he ducked under a fence. His fur was golden in the sunlight. We got on the Empire Builder as it headed west to Spokane. Tanya and I saw in the observation car until nearly dark just soaking up the scenery. We arrived in Spokane, Washington at one-forty in the morning. There is something awful about a transportation place in the middle of the night. This train depot is also a Greyhound Bus Station, and there were a number of people scattered around who all looked as if they were the survivors of some dreadful natural disaster: greenish complexions, haphazard clothing, staring eyes. We called the hotel and they paid for a taxi to come and get us — that was our introduction to the Downtown Spokane Comfort Inn, a wonderful place to stay. When you arrive at a motel at two o’clock in the morning, the question is, are you still arriving the night of the sixth or just extraordinarily early on the seventh? They decided to count us as an arrival on the seventh. We went up to our room and slept just long enough to miss the free breakfast. By the time we got ourselves presentable it was time for brunch. The hotel called its shuttle van and took us to Freddie Doodle’s near downtown, where we had breakfasts more appropriate for lumberjacks than two senior ladies; neither of us ate more than half of ours. We goofed around on the Internet and did laundry until we decided it was time for supper. We used the shuttle again to go to a wonderful Chinese restaurant with an immense T’ang horse statue out front. Superb service waited inside and we shared a meal of ginger chicken with broccoli and chicken with cashews and almonds. And a dessert of ice cream and banana chunks wrapped in flaky, crispy spring roll dough. Pat from the Shadle Branch of the Spokane Public Library came and picked us up at five-thirty. She said she didn’t know what the turnout would be, but a representative from Auntie’s Bookstore would be there selling books. The audience grew and grew until there were about fifty-five present, mostly women. Pat gave an excellent introduction and I sailed into my talk. They loved it, which was great. They asked some good questions at the end. A man sitting in back was interested in selling a book he had written, but his attitude was defensive-belligerent — his main concern seemed to be that his publisher would hire a “ghost” to entirely re-write it and he was angry in advance about that. Poor fellow, I tried to reassure him that that was very unlikely, but I don’t think he entirely believed me. We sold a lot of books, too, and I signed the leftover stock for Auntie’s. We went back to the hotel and slept until Midnight. We got on the train to Seattle, Washington, going through the Cascade Mountains. When the sun came up the morning we were surprised to find ourselves in a desert. I didn’t know there were so many shades of terracotta! Low mountains were in the distance, and the ground in front of us was scattered with big dark rocks, as if there had been a gigantic explosion a very long time ago. The ground was thinly covered with tan grass and clumps of some kind of vegetation. Then, abruptly, we were beside a big river, which turned out to be the Columbia and equally suddenly there were orchards. Tanya said they were probably apple orchards, since Washington State is known for its apples. The mountains approached and became snow-capped, and now we’re in a dense forest with rushing rivers and several tunnels. It seems every twenty minutes or so the scenery changes. Our hotel proved to be far away from the downtown, and when we got there our room hadn’t been cleaned. So we recalled our cab driver, a friendly Palestinian, and ended up at the Pioneer Square Hotel in the heart of Seattle. It’s an old-fashioned building with high ceilings and heavy wooden doors and a real fireplace in the small lobby. We threw our bags in the room and raced over — walking distance! — to the Mystery Bookshop. I didn’t change out of my crow skirt and blouse. Didn’t sell many books, but was ensconced in a huge, comfortable leather chair and had lots of interesting conversations. One of the employees used to be SCA and we had a great talk. We bought some books, which they would ship home for us. We went to Pike’s Fish Market and watched four fish shop employees toss huge fish to one another, bought some dried apples and fruit candy, then went to a very late lunch/very early dinner at Ivar’s right on the bay. I had a cup of clam chowder which was fabulous and the shrimp scampi. 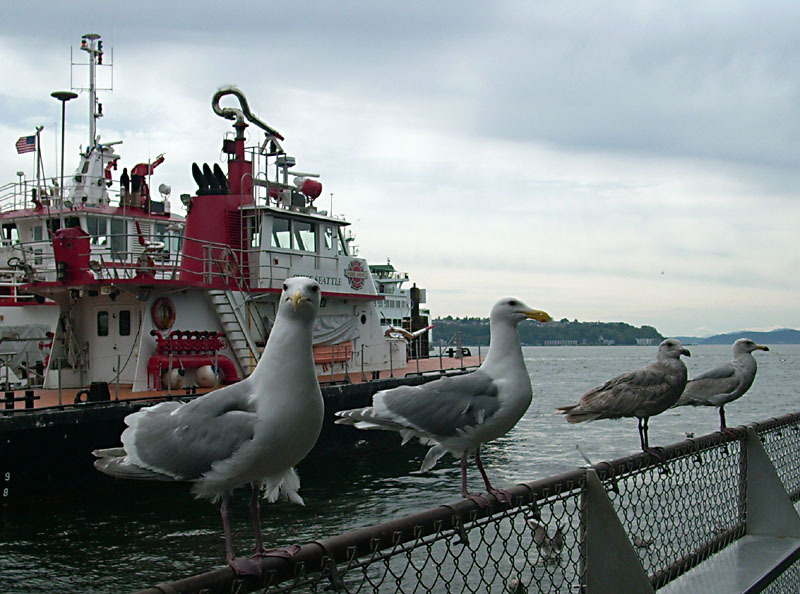 I saved my oyster crackers to toss to the long row of noisy and large seagulls who gather for that purpose on a railing alongside the restaurant. Then we took the “underground” tour of Seattle. 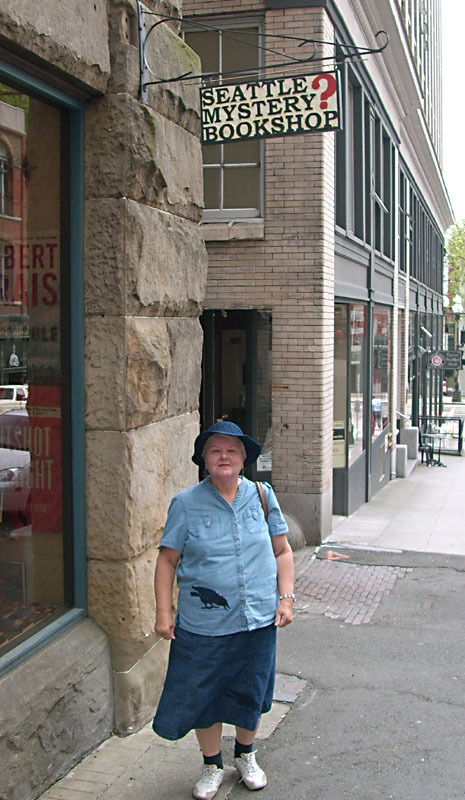 When it was first settled, Seattle was on a tide flat, and the first floor of the buildings sank out of sight. The rest burned down, and a new city was built on the ruins. But the original first floors still exist and you can explore them with a guide, who says many insulting things about the city fathers. Early to bed, of course, and early to rise to catch the 7:30 train to Portland, Oregon. Wow, the train depot in Portland is magnificent! It’s old, from the heyday of train travel, the two-story-high walls lined in huge slabs of shining marble. 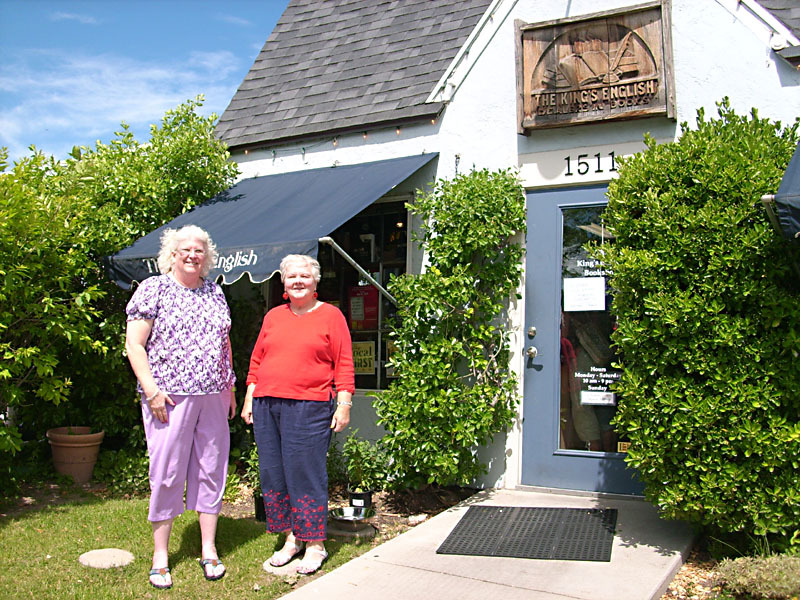 We were met at about 2:30 p.m. by Shirley Albeck, a part-timer at the needlework shop. She was having trouble getting her GPS to work, and kept disagreeing with it about the route to our hotel, the Shilo, on the other side of the two major rivers that slice Portland into sections. 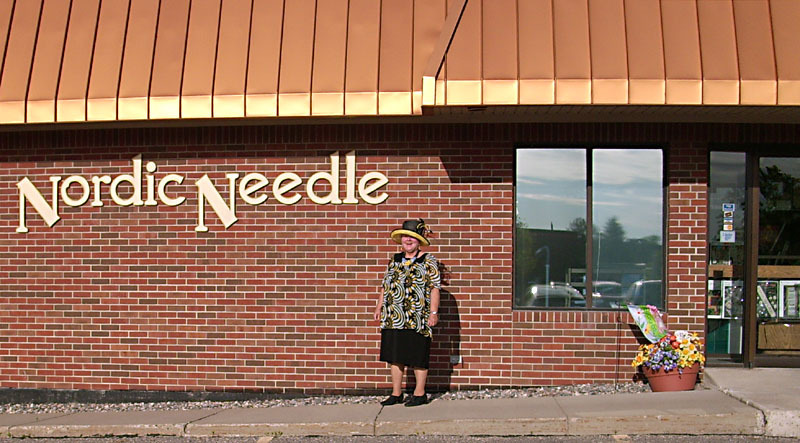 At 3:30 Shirley was back to take us to The Playful Needle, which turned out to be a beautiful, mostly-needlepoint shop. A bountiful repast of mixed fruits, bars and cookies, and cheeses was laid on for us. An Asian woman, whom I’m ashamed not to be able to name, brought books to sell — her shop is Booked for Murder. It turned into kind of a Monday Bunch time, women came and talked stitching and local gossip, bought a book or two, and asked me about the writing process and how I came to write needlework mysteries. An exceedingly pleasant evening! Pouring rain this morning. Somewhere along the way I lost my reading glasses, so we walked the couple of blocks to a Walgreen’s and I bought a new pair. And we bought postcards — did I mention we sent postcards home from every stop? They went into a scrapbook Tanya was already planning, and got me to plan one for myself. Back to that magnificent train depot — it’s on the National Register, no surprise. Because we had a roomette reservation, we got special treatment. There is a separate room for us at the depot, very comfortably furnished, with cable television, newspapers, fruit juices, and coffee. Plus a room where we could leave our luggage and not have to haul it around with us. We didn’t want to check our luggage because we were going to be on the train all night and wanted access to our jammies and toothpaste and a change of underwear. Meals are included and we got on in time to have lunch, then attended a wine-and-cheese tasting in the lounge car exclusively for sleeper passengers (though it cost five dollars). I went to our roomette to work on the Diary and Tanya went up to the lounge car. The scenery changed from farmland to mountains. Low mountains, evergreens going all the way to the tops. And lots of swollen rivers. The rails are owned by freight haulers, BNSF along the Empire Builder route. The staff on the passenger trains call them “the landlord,” and we had to pull into a siding now and again to let the freight trains go by, which sometimes made us late. When we could, we ran really fast to make up the time. After awhile we were running along the top of a mountain, nothing but tall pine trees out the windows. Lots of tunnels suddenly block vision. Now and again the ground to one side will open up and you look down and down into a huge bowl of cloud. Sometimes the clouds rise up and obscure the trees, lightly touching the windows, making it like travel in movie-land Transylvania. Fascinating, eerie, beautiful. The roomette was very tiny, smaller than a walk-in closet. There are two seats facing one another and that’s about all there’s room for. You get a window all to yourself, and a sliding door to a narrow corridor outside it. Two carpeted steps/shelves were on one side of one of the seats — it turned out they are what you climb to the upper bunk on. The two seats have a tiny table that lifts and drops into the wall under the window. We deployed it and I worked on Threadbare while Tanya worked on a counted cross stitch piece of butterflies – she bought it at Nordic Needle and was making swift, beautiful progress on it during this trip. Our steward, Paul, had a roomette/office right across the corridor from us. He brought me a bottle of sparkling apple cider and Tanya a small bottle of champagne as soon as we were underway. When bedtime approached, Paul came in and turned the two lower seats into a bed and pulled down a sort of long container in the ceiling to form the second bed. I elected to sleep up there. It wasn’t too uncomfortable, but exceedingly narrow. It was a hazardous climb for a woman of my size and age, and I was immediately concerned about how I was going to climb down again. There is a webbing harness to hook into the ceiling so you won’t roll out, but it seemed to only come up to about waist level from my feet, and I was concerned that what it would do was ensure that if I tried to fall out I would land on my head. Still, I managed to fall asleep. I woke about three having to go to the bathroom but was nervous first, about climbing down, and second, about waking Tanya. But she was having trouble sleeping and at last got up and went up to the lounge car. I managed to get down, and then tried to go back to sleep in her bed. She had pulled the curtains open and after awhile I became aware that the sky was clear and there were millions of stars visible. I lay and watched them for awhile, then dozed off until about five-thirty. I went downstairs to the luggage racks and found my suitcase, and retrieved my little plastic case with toothpaste, deodorant, etc., in it and went into the tiny bathroom to wash up. And left it all behind, toothpaste, deodorant, even the plastic case — I guess I wasn’t fully awake. I got dressed and Tanya came back, already dressed, and Paul turned our sleeping accommodations back into a seating arrangement. We looked out the window at farmland and unfamiliar trees — and suddenly there were palm trees. There is something very cool about palm trees. We got off the train around six am in Sacramento, California, and took a cab to the Hilton Hotel about twenty-three dollars away. The Hilton was very accommodating, they let us check in despite the very early hour. We put our bags away, and came down to the hotel restaurant for breakfast. The concierge, a nice-looking older man, drove me in the hotel shuttle to a nearby Walgreen’s where I replaced most of the stuff I’d left on the train. A woman named Cynthia Lefler, or Leffler, came to pick me up around eleven forty, and took me to lunch in the hotel restaurant. I just wanted a salad and they offered a most delicious beef one, consisting of mixed greens, little bits of mango, and exceedingly thin slices of rare and very tender beef in an Asian dressing that was just a little spicy. Fabulous! Then off we went to the Del Paso Heights Library a small neighborhood one with a nice little woman in charge. Only about six people showed up, so I didn’t stand at the lectern but sat in a turned-around chair and we had a discussion about mystery fiction writing. It went very well. Then off we went to the Arcade Public Library, a somewhat older one, where two rows of chairs were already filled with senior ladies, all Betsy Devonshire fans but one, a black woman who had some questions about getting a mystery novel she was writing published. The senior women were intrigued by her inquiries so it was good. They had baked cookies to make a bit of a reception after my talk, so I ate about four of them and drank a cup of raspberry-apple herbal tea. Then it was off to the Belle Coolidge Library, which was celebrating the completion of a renovation with a party in an adjoining park. They had a clown who painted faces and made balloon animals, a magician, a DJ who played mostly old rock numbers, and a table laden with very large cartons (five gallons?) of ice cream. I had volunteered to dish out, so they put a big denim apron on me, issued a pair of thin plastic gloves and a scoop, and set me up to dish out the chocolate. I dished out the whole carton in just under an hour — there were about 1700 people there with two tables each offering four flavors, so we were constantly busy — and started a second one, when my right shoulder blade announced it had had enough. There was a fairly high wind under a cloudless sky, the little Styrofoam dishes kept blowing away, all the people were polite and patient. My hat blew off once and right into one of the ice cream carton lids but not a whole lot of vanilla ice cream got on it. But I was chocolate ice cream up to my right elbow as the carton emptied. Cynthia took me back to the Hilton where I found our room empty. It was nearly 8 pm and I was hungry, so I went to the elevator to go down to the restaurant and when it opened on one, there was Tanya, on her way back up from dinner. So we went to the bar and I ordered chicken wings — delicious! — and she had a Drambuie. She said she had napped and taken the shuttle to a local mall and shopped a little bit, then come back and worked on her cross stitch. She was starting to get concerned because I was so late getting back when I finally showed up. We checked our e-mail and went to bed. The next morning we had breakfast, packed, and took a cab to the train depot, which is large and old but not as nice as Spokane’s. 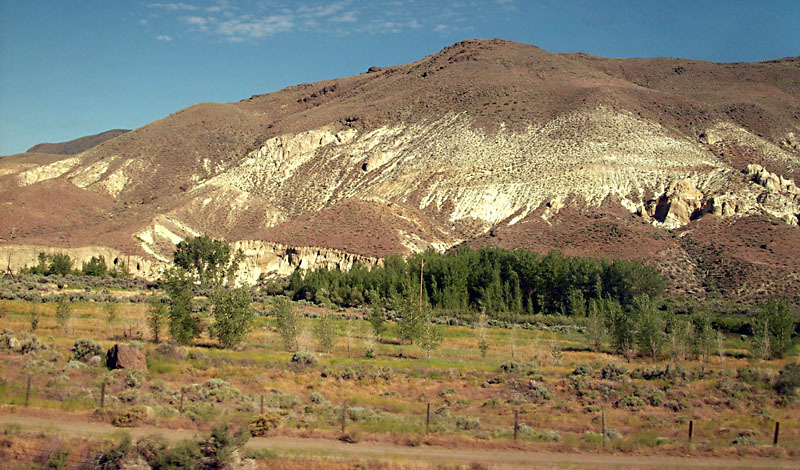 The train pulled out on time — 11:49 — and we set off eastward, through the Sierra Madre mountains, where the soil is red and the rocks are gray. Open vistas are few, but show snow-capped mountains in the distance, pine-tree-covered mountains close up. We had lunch with two New Zealanders, a nice retired couple. He’s a steam-locomotive enthusiast, meets fellow hobbyists all over the world. This is their third or fourth trip to the States. They’ve been all over Europe. We arrived in Reno, Nevada at 4:46 pm and checked in at Harrah‘s. The train used to stop right in the middle of downtown, but now travels an enormous concrete-lined trench, and its disgorged passengers have to take an elevator to street level. The person who told us Harrah’s is very close by was right, it is practically across the street. Harrah’s is really big, and a bit noisy, with all the slot machines twinkling and jingling at you as you pass by. Our room was on the fourteenth floor of the East Tower, nice and quiet up there. That evening I was introduced to three-card poker at which I am terrible. Everyone, even the dealer, gets three cards. Bets are placed in advance, before you know what you have drawn, and then you look. The dealer turns his over and takes your three and turns them over and tries to make a Jacks or better five-card hand of them. No wild cards. The chips are five dollars and you bet at least two of them and it’s a quick way to go through sixty dollars, let me tell you. Tanya did a whole lot better than I did, though she was down about thirty dollars before we quit for supper. We ate at Ichiban’s, where the chef cooks your meal right in front of you while telling jokes and juggling his knives and choppers. The food was terrific, but the meal cost around fifty dollars. After dinner I decided I wanted to learn to play craps and had rather a run of luck for awhile. I was just betting ten dollars that I would make my point but this gentleman up the table was making all kinds of complicated bets on my throws and winning a lot of money. I got bored with it, and Tanya took me to the Pai Gow table, but the games open were expensive wagers so we went back to craps and boy, had the dice cooled to me. Another expensive lesson: when the dice are hot, stay at the table. I actually won some betting against myself! The beds are very comfortable here, and I slept well. This morning after breakfast (crepes!) I decided I really had to do some laundry and it turned out there’s a Laundromat only about five blocks away, so we walked over. It was offering a deal of free drying for a wash. So now I’m up to the right count on underwear again. Tanya lost the back of her cell phone somewhere in the casino and couldn’t find it, nor was it turned in, so she was without a phone, sad for her because she was calling home every day. 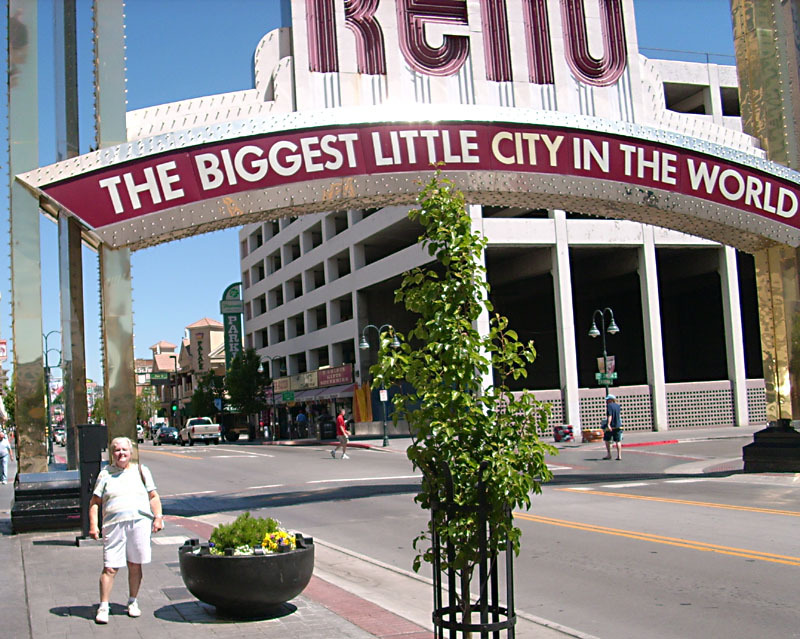 We spent the next day goofing around Reno, which has a very beautiful walk alongside the Truckee river, now swollen with snow melt, and from which Reno gets its drinking water. 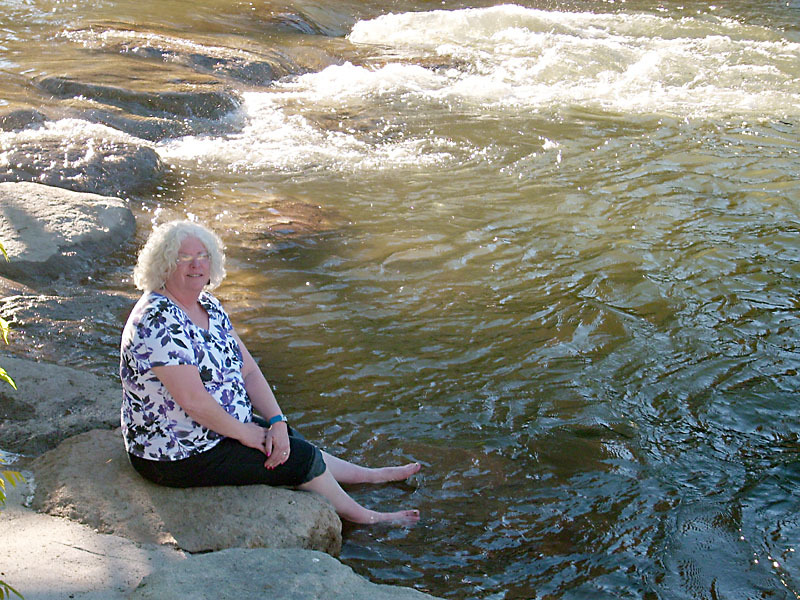 It was very warm, but there is a delicious cool breeze coming off the swiftly-moving water. Then we tried some desultory gambling again but quickly lost everything. I have concluded that if I want to reliably win at gambling, I should buy a casino. Our train pulled out of Reno at around four o’clock. We were in another roomette and due in Salt Lake City, Utah at 3:45 am. As the last time, we were right across the corridor from the conductor/steward, who announced that, because he had to get up so early to help people off the train (which was abound for Chicago) in Salt Lake, he was going to start turning the seats into bunks at eight o’clock. We went to dinner at 6:30, then sat in the lounge car playing rummy until I felt ready for bed. This time I decided to go all the way, and changed into my pajamas. I brought a change of clothes up to the top bunk — there is a long net suspended along the back length of the bunk so I stowed my clothes in it along with my plastic bag of toothbrush, etc. Then I climbed up and in. After a short session convincing myself I wasn’t going to roll out, I fell asleep. I think Tanya came in around midnight, poor thing, because we crossed a time zone and lost an hour, so she barely got to sleep before Zenon (Xenon?) came and woke us up. Some day, someone will make a comedy movie scene of a fat old woman trying to shed pajamas and put on underwear, shorts and a shirt in the top bunk of a train roomette. There is not much room side to side, and not enough room to sit up. Plus, the train is rocking and rolling along. After awhile I saw the humor in it myself and started laughing. She took us to our hotel, the Sheraton, an exceedingly nice place, and got us installed in our room on the ground floor. We went to bed, slept till nearly eleven, got up, phoned Sandie to say we’d love to see this bookstore she wanted to show us. Then we showered, had lunch in the hotel restaurant, Olio’s, and on our way out, there was Sandie with tall, slim, blond friend Alice. Alice put us in her very nice Volvo and off we went to King’s English bookstore. Salt Lake City is gorgeous, full of amazingly huge and beautiful public buildings, surrounded on all sides by snow-capped mountains — one range of which goes east and west (“I guess it didn’t get the message,” said Alice). King’s English is in a long, one-story building, very picturesque, divided into many rooms. I don’t think I’ve ever seen so diverse a collection of books in so compact a space in my life. I bought a C. S. Lewis book and P. J. O’Rourke’s latest and asked them to ship them home for me. We met Ann, the owner, who is going to be selling my books at this EGA event. Like all small business owners, she is competent, busy, friendly. She promised to bring some of her shop t-shirts to sell, because I forgot to buy one and I want one. Then we went to a Walgreen’s where I bought a mouth guard (I grind my teeth in my sleep and my old one was in the plastic case I left on the train). Then we went to a T-Mobile where Tanya bought a new phone. We had wings and margaritas in the hotel bar and I decided against going to the outdoor pool — it’s very warm here in Salt Lake City — in order to write the next chapter in the Diary. I am a Star! My speech was extremely well received last night. I was, for some reason, really nervous beforehand, hardly ate my delicious banquet dinner of a large, marinated pork chop and mixed veggies and mashed potatoes. I took a glass of water to the lectern with me, and was grateful for it, because my throat was very dry. Salt Lake City is 4500 feet above sea level, and the air is thin and dry. Once I got underway, I was all right. They laughed hard and even applauded the stitcher’s line, “Better finished than perfect.” So the hard part of this stop was over and a success. We went to the genealogy building in Salt Lake City the day before. It’s a four-story building with a basement and a sub-basement all given over to genealogical records. Computer stations abound — all searches begin on the Internet. But they also have thousands of volumes and miles of microfilmed records. My sister Dolores is the genealogist for our family and when she heard I was going to Salt Lake City she gave me a short list of names to look up. I had very poor luck, though. One name was Johannes Wendel Pulver, who was born in Weid, Rheinland, Prussia in 1679. He’s the one who brought the family to America in the early 1700s. Dolores wants to know who his parents were. There are microfilmed church records of the area and I searched the baptismal records and couldn’t even find a Pulver, much less Johannes Wendel in any year plus or minus five. But the records were for a reformed evangelical sect, not Lutheran or Catholic. (The Catholic records for that period and place are missing.) I ran out of time before I could delve into the Lutherans, so there is a new place to start if I — or Dolores — ever get the chance. It’s a cool thing to be looking at handwritten pages from so long ago. Tanya and I went for a swim though the sky had clouded over and there was a chill breeze blowing. The pool water was warm and we splashed and swam all alone for about an hour before retreating to the hot tub in a room that adjoins the pool. Yesterday I spent almost all day in a class about Romanian Point Lace. Our teacher was born in Romania and began learning to make the lace when she was ten. Her name is Sylvia and she was both enthusiastic and talented. She did an excellent job of transmitting her enthusiasm as well as the techniques of lace making. The lace is built on a piece of cloth with the pattern traced on it. A special cord (we were later taught how to crochet the cord) is basted to the outline of the pattern, and then the spaces surrounded by the cord are filled with different stitches. We used the Russian Stitch and Fan Stitch. We did a small practice piece and then were allowed to start basting the big piece but before we got very far, she stopped us and taught us how to crochet the cord. No simple chain stitch here! She got out a very large crochet hook and a thick piece of cord and showed us over and over how to do the stitching. To make the actual cord you use crochet thread size twenty and a steel size four crochet hook. I had never handled a crochet hook that small and was very grateful I had brought along my really strong magnifying glasses. You keep turning the cord as it develops in your fingers and the result is a series of small picots or loops along each edge of it. When you do the filling stitches you run the needle through these loops to anchor the thread. Later, I went to a room set aside for stitching to see if I remembered how to do it. Rather to my surprise, I did. There was an exhibit room at this convention full of wonderful works done by local stitchers. Most of it is counted cross stitch, but there was also Hardanger, lace, free embroidery, stump work (three-dimensional, the leaves and flowers rise up off the fabric in a wonderful way! 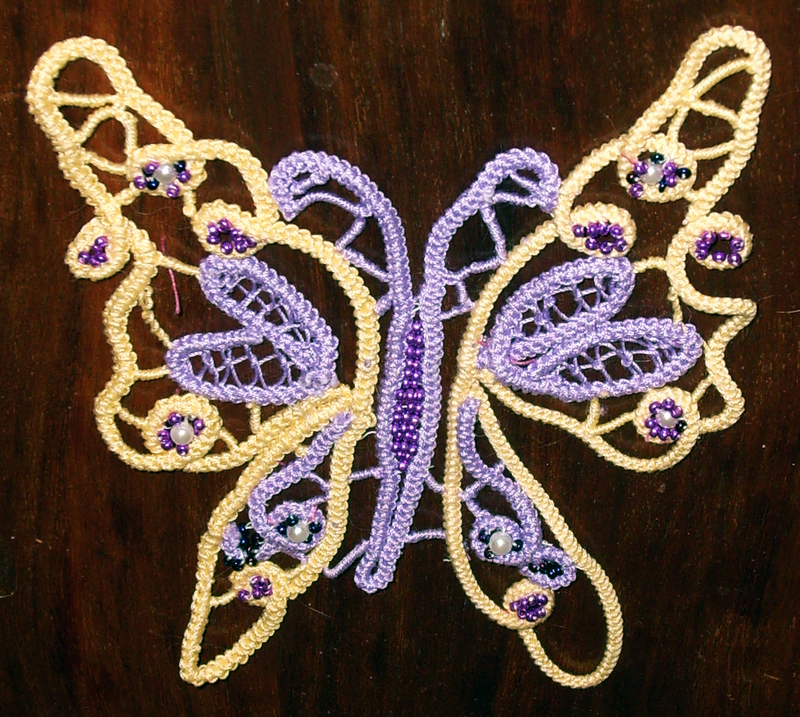 ), beadwork, and some techniques I didn’t recognize. Some used gold and other metallic flosses, many combined techniques. At the back of the room was a very large four-panel piece worked on by thousands (literally) of stitchers all over the country. It is in the shape of the United States with small representations of the flora and fauna found in each area. It is gorgeous and is a traveling exhibit owned by EGA. It will, most likely, wind up on permanent display at their headquarters in Louisville, KY, but meanwhile I was very glad to see it here. I was wrong about the book signing, it was last night. I put my fancy duds on and went down to the open space in front of the big banquet room where a whole bunch of vendors were setting up to sell lots of goodies. Because the vendors were in the banquet room and I was going to be outside it, Sandie let me go in early to look at the stuff for sale. Gosh, what beautiful stuff! But I resisted and resisted until I got to Sylvia’s table. There I let loose and bought a pattern book, a kit, and a CD of instructions. Her stuff was pricey, she set aside the three items (because they weren’t open yet), and later I sent Tanya in with a hundred dollar bill and instructions not to look at what she was buying because one of them is her Christmas present (I hope). The total was nearly eighty dollars! Now I know I have to master this technique, so the money isn’t wasted. Fortunately the patterns are reusable. King’s English sold, and I signed, a whole lot of books, which had all of us very happy. Today I spent the morning in the Studio room, where people who have been taking classes can finish projects or practice techniques. I think I finally got the crochet technique down; at least my cord started to look usable. I’ll have to buy more of the DMC crochet thread if I’m to make any usable lengths of it. But oh, I’m so slow! Our plane left at 2:20, on the twentieth day of the trip. It was kind of a downward bump, back to the hassles of air travel, and the plane dipped and bumped and slid sideways as we fought our way up to cruising altitude. This was a fabulous trip, every minute of it has been interesting and enjoyable, even the three a.m. arrivals of the train. We have made some new friends I hope we can stay in touch with. When I got back home I joined the local chapter of Embroiderers Guild of America and have gone to several meetings. I’ve had other adventures this year, some quite glorious, but none the equal of my Great Train Journey. And by golly, I did get the hang of Romanian Point Lace!